A print cleaner is a petroleum based solvent used in various situations but mainly for cleaning when making prints. It is used in the process of making lithographs, as a painting oil medium, for cleaning oil-based ink, and for removing ground in copper plate printing. 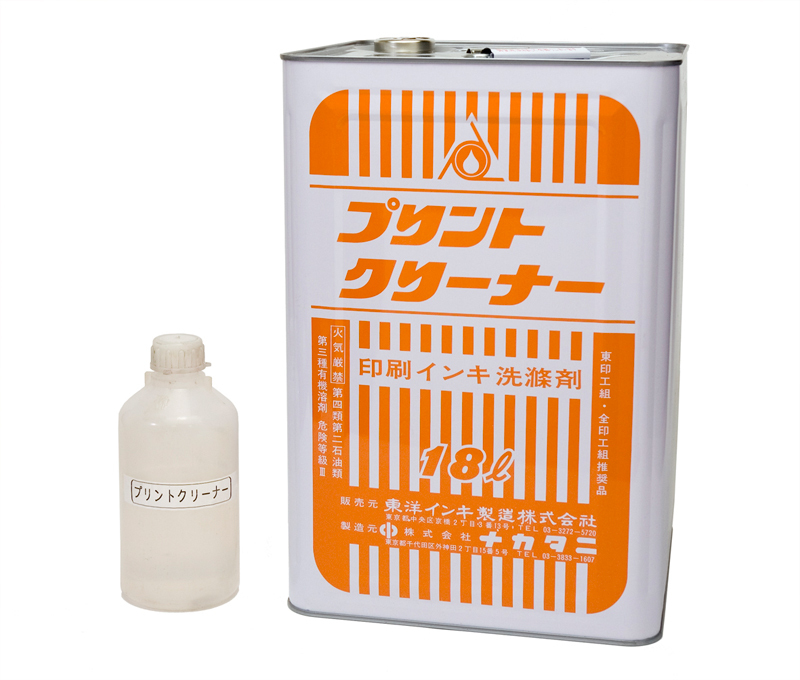 It contains petroleum hydrocarbon made by purifying distilled mineral oil and is a colorless transparent liquid with a faint smell of petroleum. Typically, a small amount of print cleaner is poured on the printing plate and a rag is used to spread it over the plate to dissolve and wipe off ink and colorants. In lithography, it can be used as an alternative for tusche medium. Turpentine was originally used in lithography and as a painting oil medium, but print cleaner came to be used because it is relatively inexpensive. It is a volatile, flammable liquid and it should be used and stored in a well-ventilated room and be kept away from flames. Since the solvent cannot be purified naturally, it should not be poured down the drain after use. White gasoline and kerosene may also be used as a substitute for print cleaner. More recently, safe and environmentally-friendly vegetable oil-based solvents are also available on the market, though they can only be used for cleaning. Being vegetable-derived, they have less effect on the human body. They have less impact on the environment too because they remove dirt through emulsification with water. Print cleaner can be purchased mainly at art supply stores that handle printing supplies.